Lying in our sleeping bags this morning we noticed a thin layer of ice glittering inside the roof of our tent. It really was very cold overnight and while our sleeping bags, and Philippa's many, many layers of clothing kept our bodies warm, our faces were pretty chilly. Philippa, to her credit, got straight up and made us hot drinks while I burrowed further down into the sleeping bag and waited for the sun to reach us. Eventually though I bowed to the inevitable and got up to light a fire for breakfast. Today was going to be a Big Hike day and we fueled up on bacon and eggs (again) while birds peeped at us and pecked about hoping we were messy eaters. 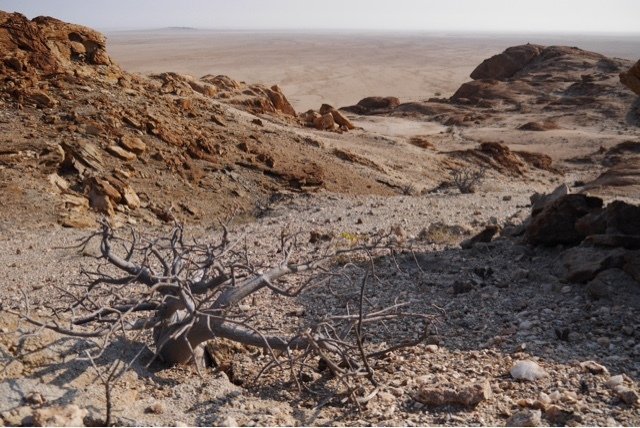 The Olive Trail is a 10k hike in the Namib Naukluft park a half hour back down the road from the campsite. Johan the jovial, ruddy faced guy who runs the campsite had recommended it to us as an alternative to the more famous "Waterkloof" trail, which he said was pretty tough and would require an earlier start than we were really prepared to make. So Olive it was, and it started with a slow climb into the mountains with the occasional olive tree along the way and P and I wondering if we had actually taken the soft and slightly dull option. But as we climbed the view opened out and soon we were looking across the plain to another line of hills, with our truck a little white dot in the trees below. 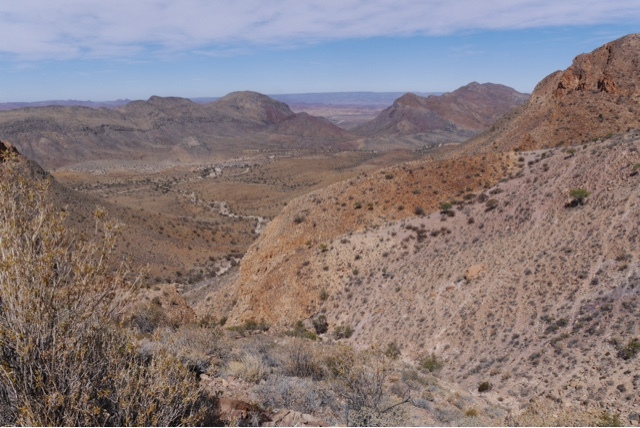 After about a thousand feet we came to a plateau which looked into a series of canyons, one of which we had to climb down into. 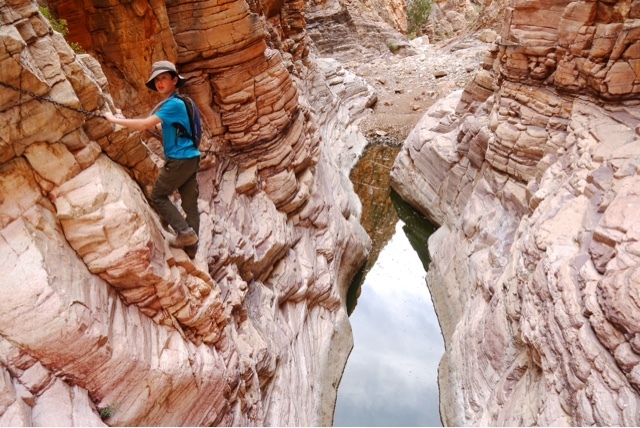 It started gradually enough; the canyon walls were low and wide apart with a smooth path between them. But gradually the walls grew either side of us and narrowed in, with rocks growing to the size of small cars obscuring the trail altogether. We were jumping from boulder to boulder with rock walls towering over us. We stopped for lunch on one of these huge rocks, watching dassies sunbathing around us. 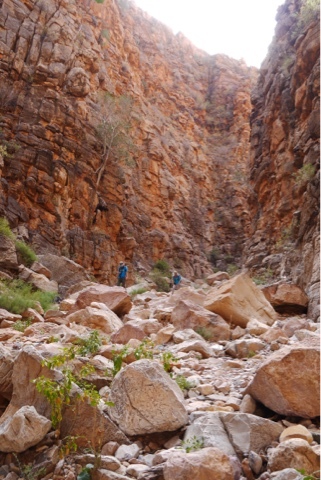 It was hard work picking a trail through, over and around these boulders and eventually we came to a narrow canyon with a pool of dark water in the bottom of it. 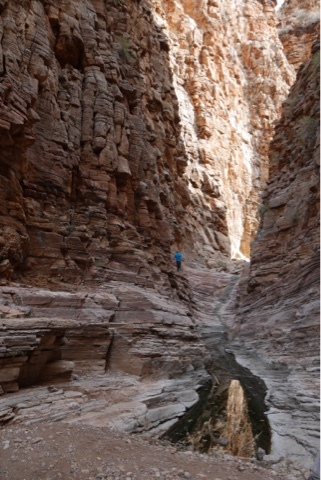 The walls either side were pretty sheer and the only way to get through was to use the chains secured into the canyon walls about twenty feet above the water. Tom, who is part mountain goat, went first. Initially even he had problems in a couple of places where there didn't seem to be any foot holds. But almost as soon as he got to the other side he started coming back again using the chains on the other side of the canyon. "Its really fun". That wasn't the word Philippa used but she was v. brave and inched her way across with her dignity intact and only the occasional plea to the Almighty. Tom by now was going back and forth like a small ape and would quite possibly still be there if we hadn't dragged him along the rest of the trail back to the truck. We celebrated with Rock Shandies at the little bar by the permit office, served by the sweetest young woman who thanked us very much for coming, and wrote out our bill for the drinks. Namibia is very keen on comprehensive written receipts for pretty much everything. The sun was heading downwards - as it tends to do at about this time of day we've found - so we drove back to the campsite and flipped out the tents again. I make that sound so easy don't I? It is actually quite hard work but we all know what to do now and get into the rhythm of it. Philippa loosens the ladders and Tom pulls the tents open. While he puts in the support struts Philippa gets the sleeping bags and torches and blankets from the back of the truck. Meanwhile I have been starting a fire and come to fit the struts which P and T can't reach and hey presto its all done. Beers, supper, bed. The sun vanished, leaving the sky a brilliant apricot. The full moon rose over the hill behind us, casting its ghostly glow and we all climbed into our sleeping bags somewhat wearily. 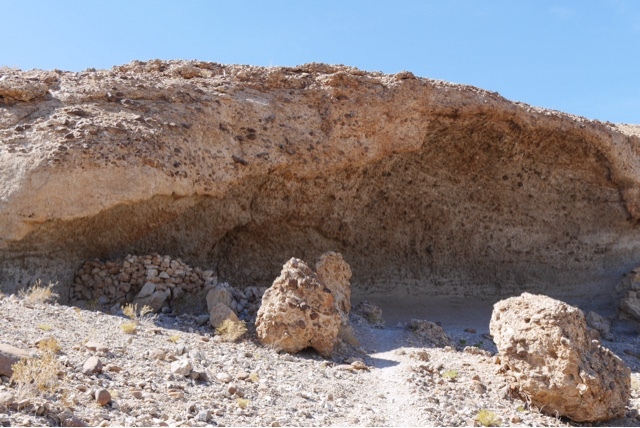 When the Second World War broke out there were two German geologists working in Namibia who decided that they'd really rather not get involved. 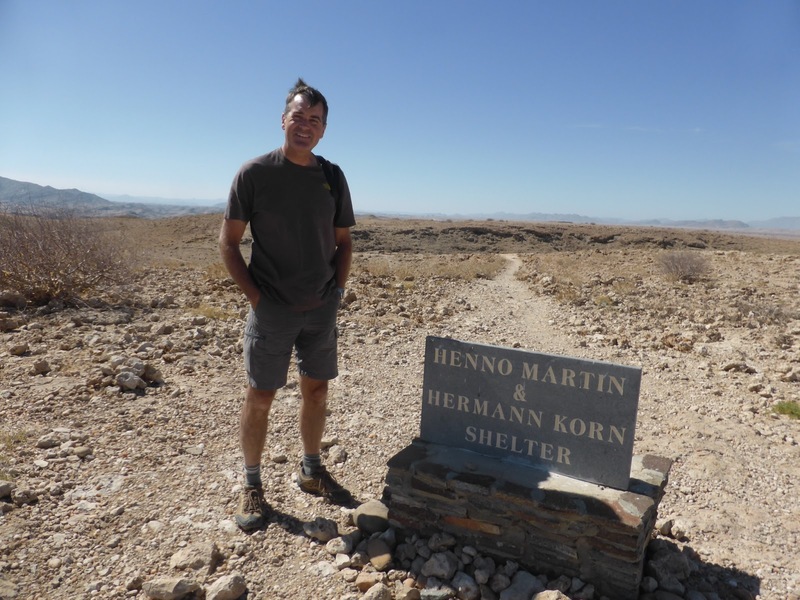 Henno Martin and Hermann Korn knew they would be enlisted to fight in a war they didn't believe in so they decided to hide out in Namibia instead. They set a false trail for any investigators and then, with their dog Otto they traveled into the desert about 40K from Mirabib (but a heck of a lot further from anywhere with people). There they found a large cave in which they built a shelter and worked out how to be self- sufficient and unseen, something they managed to be for about two years. Finding their cave was my goal for the day. It was pretty cold overnight and although it was hard to leave the warmth of the sleeping bag, it was actually warmer outside as the sun reached into our campsite. Up for porridge and hot chocolate and then we packed the tents away and reluctantly left that very special rock. The main gravel road was only half an hour or so away and we saw dust trails in the distance as the handful of cars on it swished by. Henno's cave was marked on the satnav and soon we were on another 4x4 trail to get a bit closer to it. There is even a parking area at the end of it overlooking a huge system of river gorges and ravines. We picked our way along a rocky path and after fifteen minutes or so reached a rocky overhang with a couple of stone walls inside it. 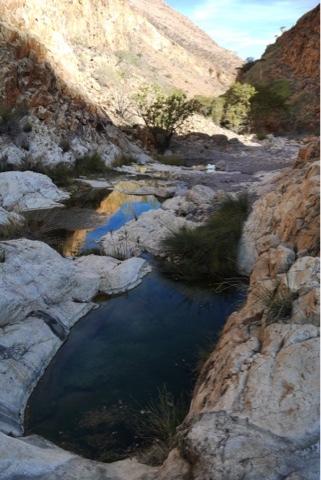 It looked out over the gorges and the - now dry - river which was so essential to Henno and Hermann and had one or two permanent pools where they even found fish. It was hard to imagine them living there for two years - especially in the winter without luxury of our warm sleeping bags, and too scared to light fires for fear of being seen. 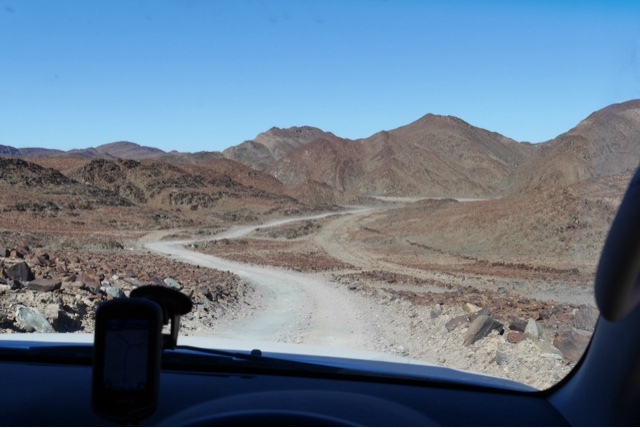 From there we drove on to the Kuiseb pass which curls steeply through the mountains, back wheels struggling for grip at times. Near the river I spotted a couple of ancient round stone houses, now roofless. 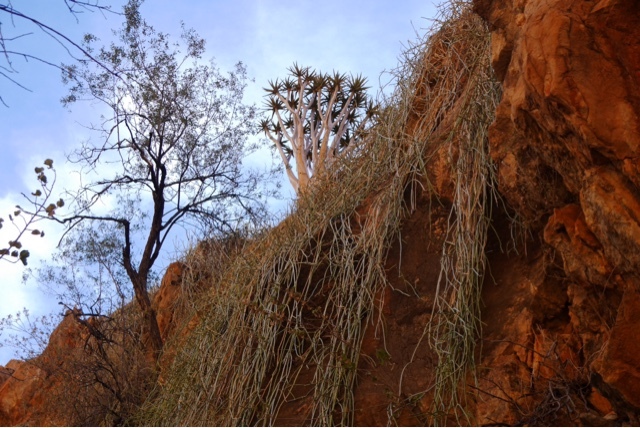 The desert was beginning to change, The pale sand of the Namib replaced by the deep red of the Kalahari basin, and dotted with many more plants. The mountains looming up either side of us were darker too - and wider and more craggy. It was a dramatic drive in the late afternoon sunshine. On a whim we stopped at tiny Solitaire to see if we could get a cold drink from the garage, and found that it had the most magnificent bakery with fancy cakes and biscuits, which obviously we bought by the bag-full. There was a grocery selling ice-cream too so Tom had some of that. 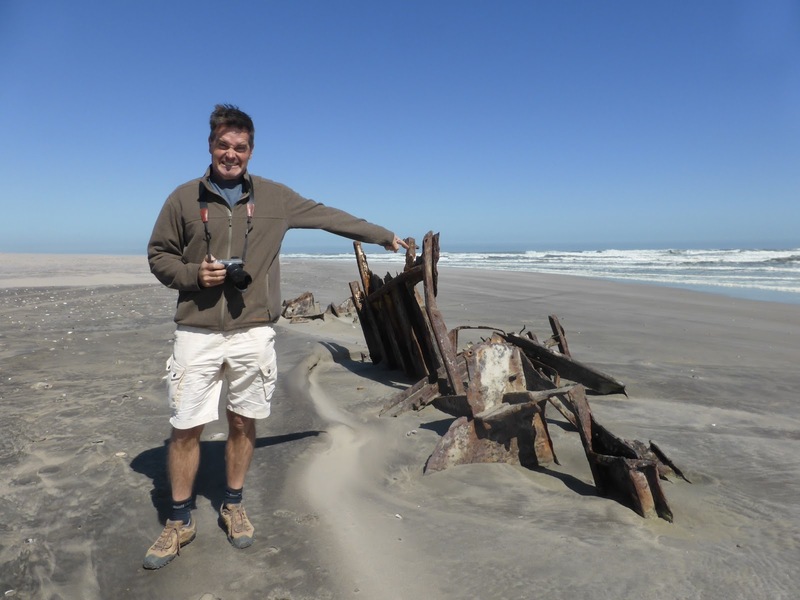 Outside were the wrecks of a range of cars going back to at least the 1950s. 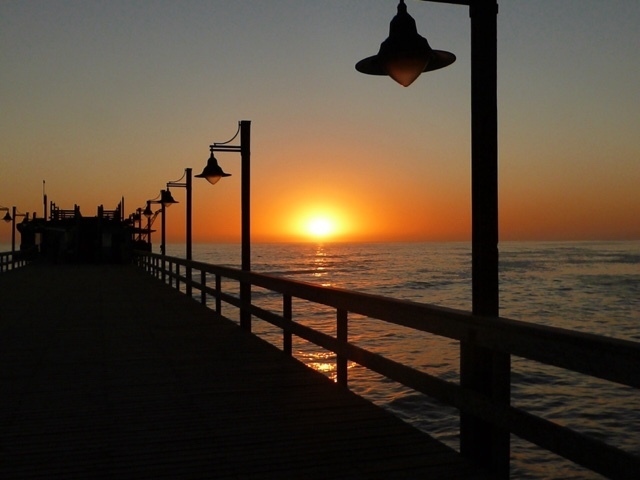 Before delving into the world of 2001 we had to leave Swakopmund, which was a great stopover in a really terrific B&B. Peter, who runs it, was so friendly and helpful and we all shook hands when we left. The morning was cold and misty to the point that I had to use the windscreen wipers from time to time, there was so much water in the air. And as we now know, its what makes the desert here special. 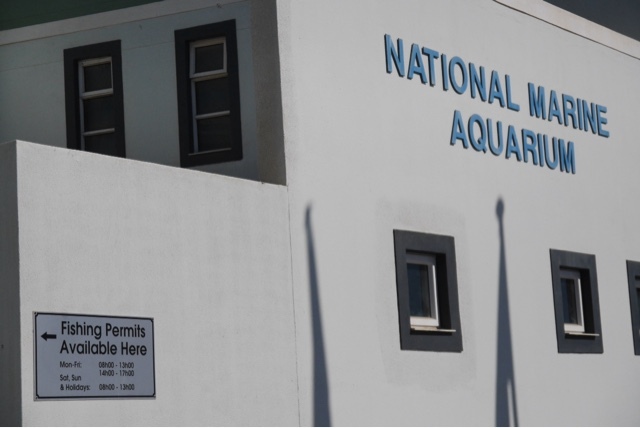 We followed the coast south to Walvis Bay, named after the whales which used to bring whalers in from around the world. It is now the main port for Namibia and as we got closer we could see tankers, container boats and tugs moored up in the mist. Its a sprawling sort of place with row upon row of tiny houses in pastel colours. 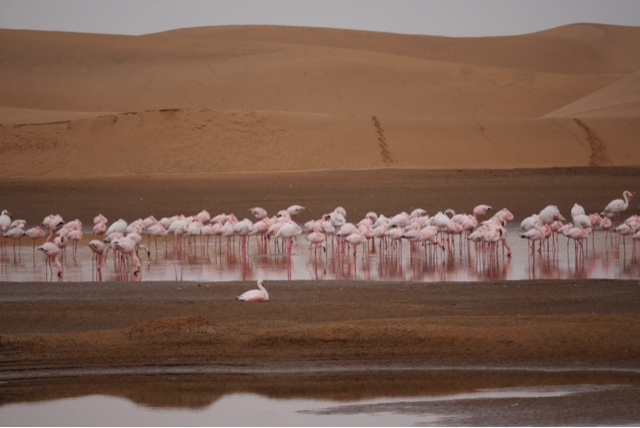 We made a sharp left turn away from the coast and back into the desert, passing several small lagoons, each with a blurry pink line of flamingos. 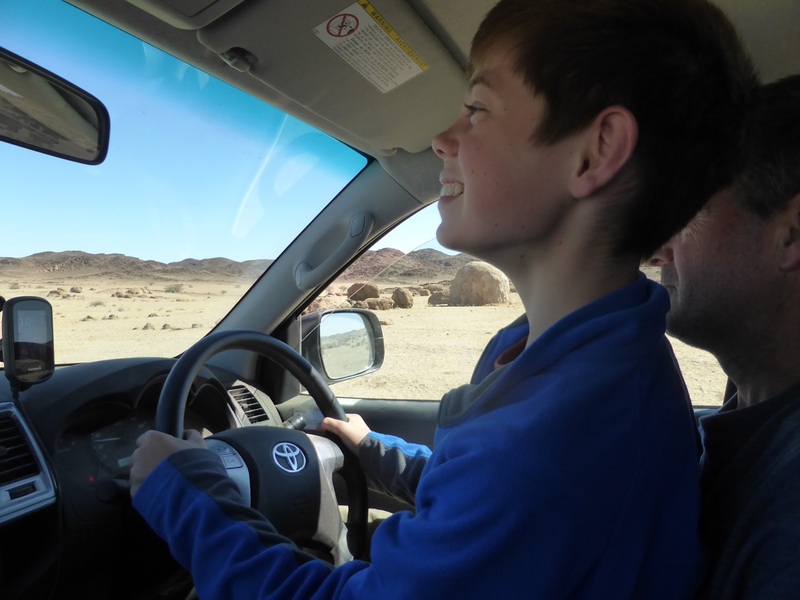 After a few kilometers we turned off the tarmacked main road and onto a desert track towards the Namib Naukluft National Park. I had to get a permit to drive on this track from the Namibia parks agency, NWR, in Swakopmund. The office was in a slightly ramshackle building, its yellowing walls lined with maps and the horns of various animals. A slightly officious lady in thick glasses had me fill out a form which she stamped several times before relieving me of about £6 which gave us permission to drive through the desert. I was half hoping someone would check it but we barely saw another soul on the whole drive. The start of the desert track ran by a number of shack-communities; houses of corrugated tin and plastic. From a Namibian novel I have just finished set in Walvis Bay I think they were Topnaar settlements. The Topnaar as far as I can tell are the gypsies of Namibia, pushed out to the edges of the established community and doing a little bit of this and a little bit of that to survive. Apart from a woman in a purple pantsuit walking across her sandy yard we saw almost no-one. As we passed through the entrance to the park we could see giant orange dunes rearing up to our right. They would sweep even further inland but for the river which holds them in check and which we were driving parallel with. 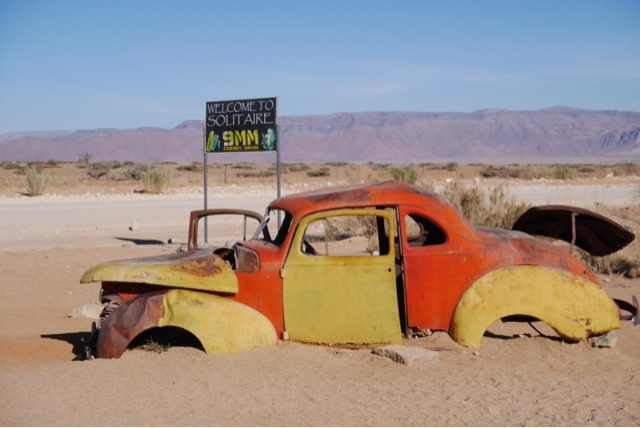 Eventually we came to a desert research station which looked like a 1950s moonbase, and at that point we forked left onto a slightly smaller track across the Namib. 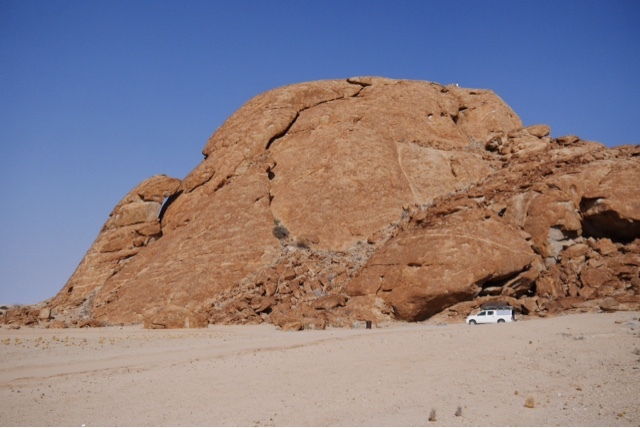 It is one of the oldest deserts in the world and very flat. It is smooth and gravelly on the top, with little tufts of blue-gey grass. We saw several Oryx grazing on it and in the rainy season it is apparently covered with animals. The road is simply a route taken by a grader at some point, mostly straight and fairly smooth. Here and there big round rocky outcrops emerged from the sand. We were heading for one called Mirabib which is where they shot the ape scenes in 2001 A Space Odyssey. In the context of the vastness of the desert, Mirabib actually looked fairly modestly sized when we first saw it. A rounded rust-red lump looming from the pale sand. But as we got closer it became more impressive - its sheer walls rugged and forbidding. 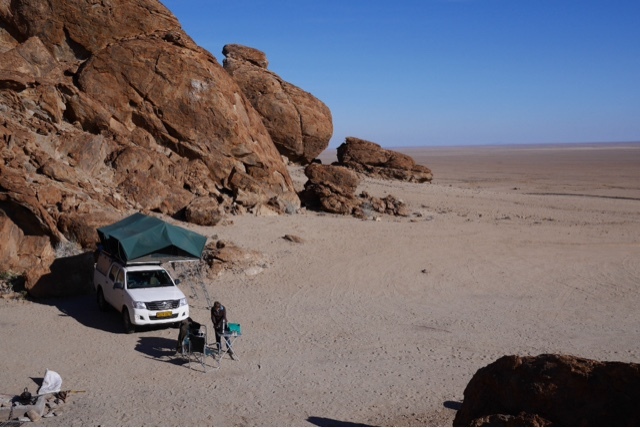 There are a handful of primitive campsites nestled into the rock and there was no-one else there so we had our pick. Tom immediately set about trying to find a way to climb to the very top and went an alarming way up the rock face before we called him down for lunch. Afterwards though we all set off to see how far we could get. It feels like such an ancient place - you could see why the filmmakers wanted to be there. There are caves and channels and little ravines all over the places. 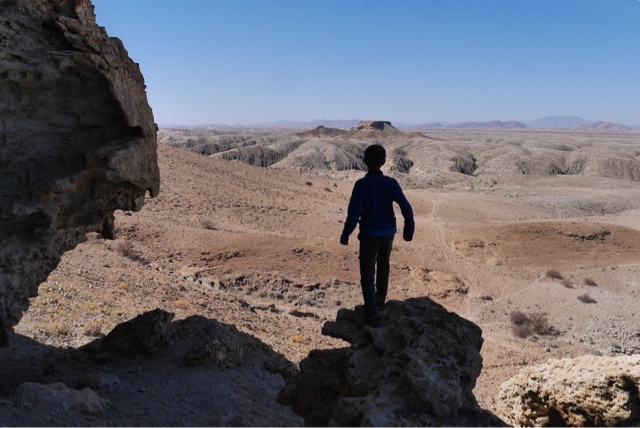 We climbed up to a small plateau which glittered with quartz and mica. There was a sudden commotion coming from somewhere - a sound like frogs or ducks all shouting at once, and then just as suddenly, stopping. We only heard them once more and never did work out what they were. We couldn't get to the top either - the rock walls were just too steep, but we found endless little places to poke about in before climbing back down to our site. There was a cold wind blowing and I got a fire going quickly. 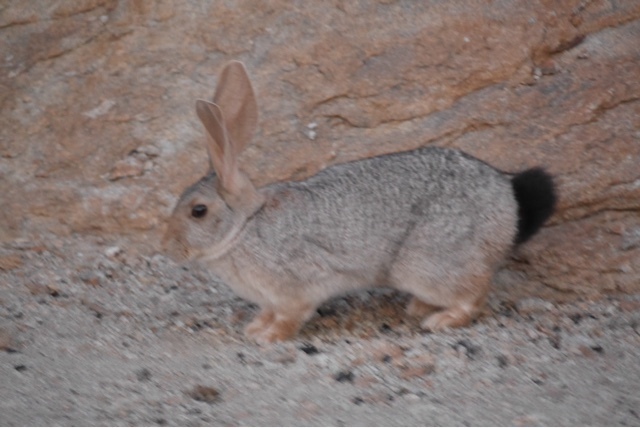 I was soon joined by a scrub hare with long ears and a black tail. It had no fear of me whatsoever and sat on a rock about six feet away to watch what I was doing. It stayed around us until it was too dark to see. We sat around the fire to have supper before heading up to Tom's tent to watch the "2001" of our time; "Interstellar". It felt appropriate and when P and I climbed out of Tom's tent to get into our own, the sky was indeed full to bursting with stars and the moon was so bright that it lit up the rock behind us with a ghostly grey light. It felt like being on another planet. 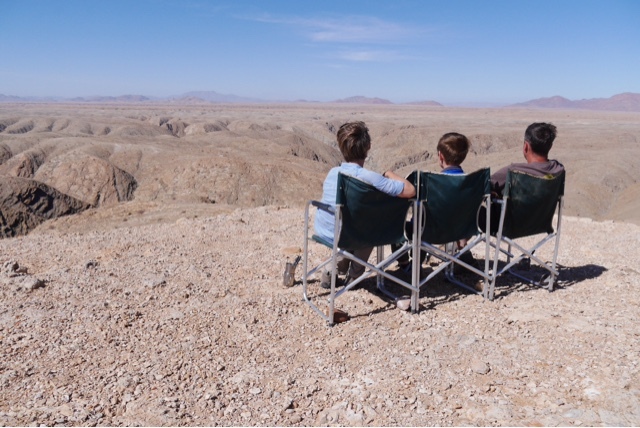 Weeks before we set off for Namibia, I booked us places on the Living Desert Adventures tour which had rave reviews on Tripadvisor. 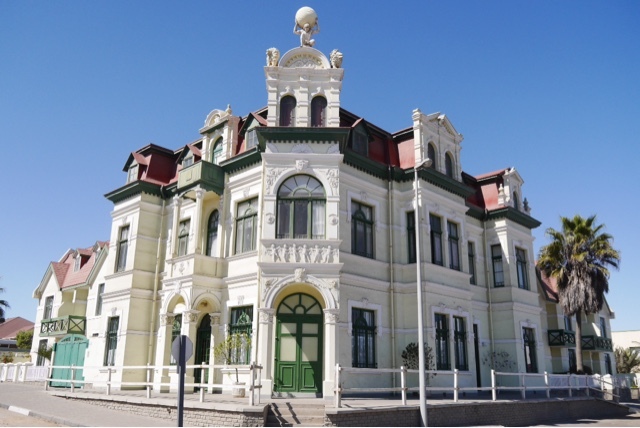 Peter, who runs the Cornerstone said it was the "best thing to do in Swakopmund" which was good to hear, and this morning at eight sharp we were picked up by a dynamic Namibian guy called Chris. 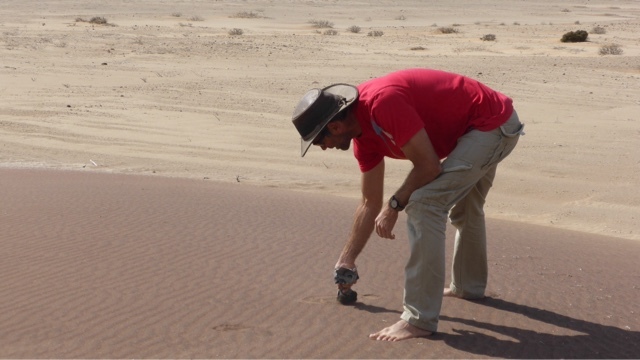 Chris Nel turned out to be an interesting chap who trained originally as an electrical engineer, before discovering that what he really wanted to do was spend time in the desert, and show people what an extraordinary eco-system it is. 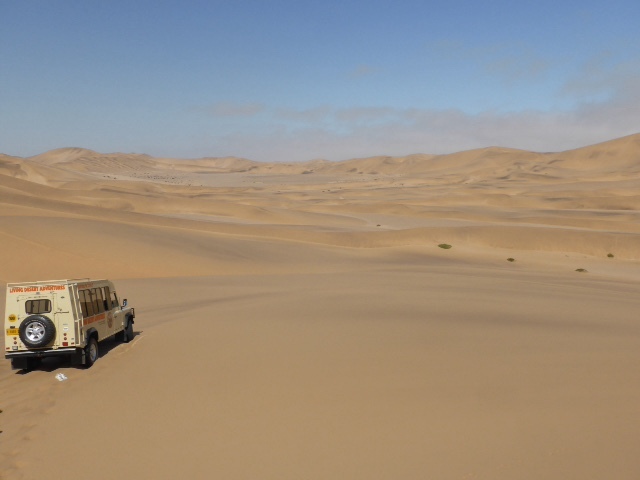 First though he had to find a way to protect the desert around Swakopmund from the many ATV and 4x4 riders who were driving all over it, killing the plants and animals and filling it with rubbish. He campaigned to protect the desert and made a lot of enemies along the way, with death threats on a regular basis from people who thought it was their God-given right to tear the place up. 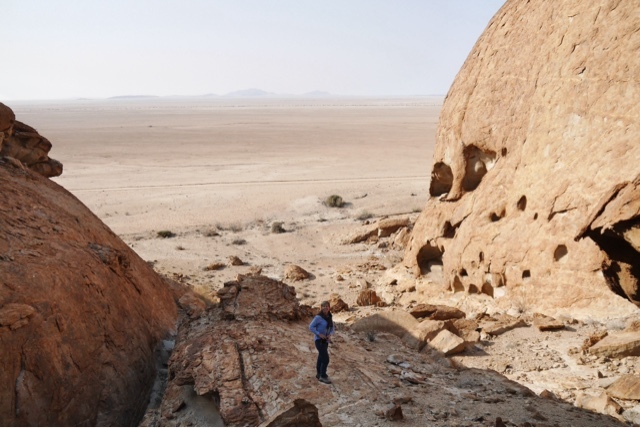 He says he got the UN involved and eventually it told the Namibian government it had to protect this rare and precious area from those who were destroying it. The Dorob National Park was created four years ago and Chris takes people through it in a fascinating and lively way. He began by telling us that the Dorob hasn't had rain for more than four years. 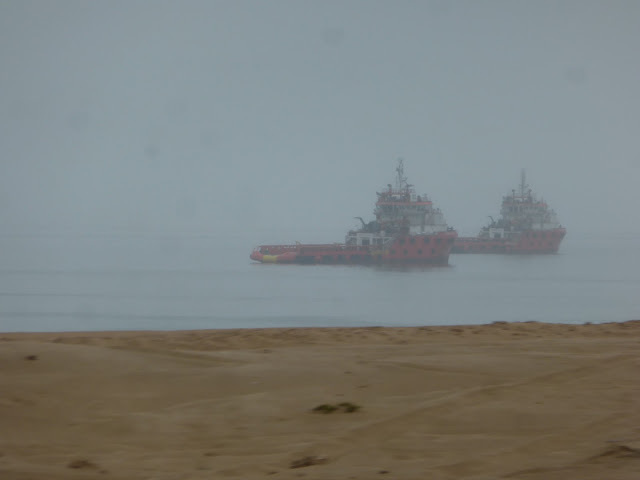 What it does have though is foggy mornings, four days out of five, year round. That fog, combined with seeds which blow in from the East ("Muesli" he called it), means plants grow at the bottom of the dunes. Insects eat the plants, lizards, chameleons and geckos eat the insects, snakes eat them, jackals and falcons eat the snakes and, well you get the idea. Chris is extraordinarily good at finding these things. He carefully dug out a Dancing White Lady spider from its underground nest and informed us there was one under our feet every three meters or so. It was a ghostly little thing and while they can get much bigger Chris said they always have babies with them and they would die if someone dug them up. So he only goes for the small ones, which he then helps dig back down into the sand. 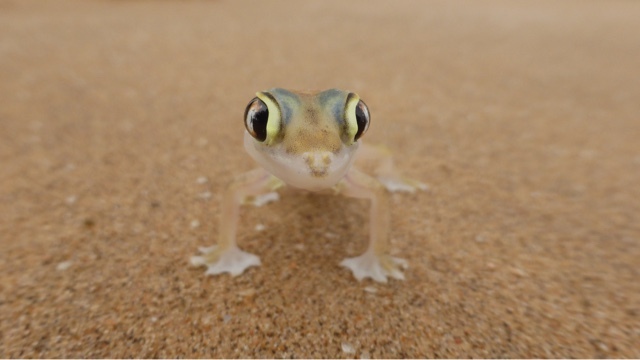 He found a beautiful little web-footed gecko in the same way - following its tracks and carefully excavating its hole. 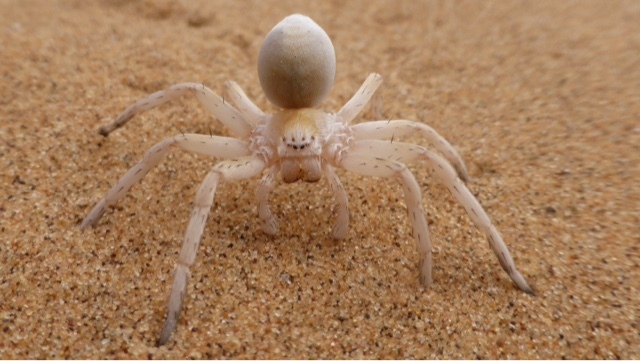 It perched on Tom's hand quite happily until Chris re-introduced it to its tunnel under the sand. Tom and I both held another find, the legless lizard or skink which Chris somehow tracked over a dune and plucked out of the sand. 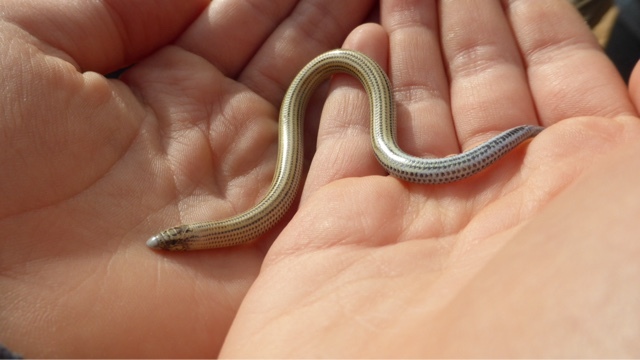 It was like a tiny eel with shimmering, sand-repelling skin. He tracked a chameleon to a bush and offered it a grub on a nearby twig which the chameleon picked up with its sticky tongue in no time. They are like little dinosaurs with their grumpy mouths and fat little tummies. 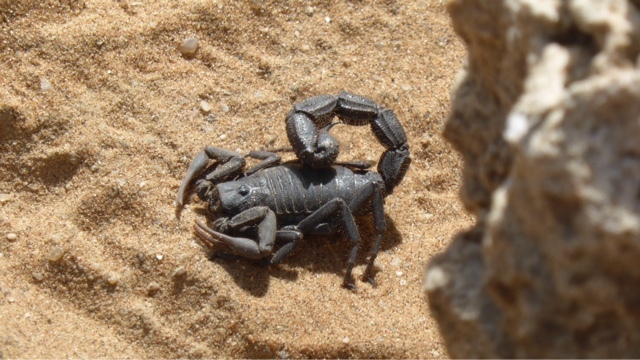 He found Namibia's most poisonous scorpion under a rock and quite calmly picked it up and let it walk over his hand - they only sting when threatened apparently, but can kill if the sting isn't treated in time. It was a fearsome looking brute. Avoid the ones with the small pincers as they have the most venom... I'm inclined to avoid all of them actually. Chris's most amazing spot though was a tiny sidewinder snake. 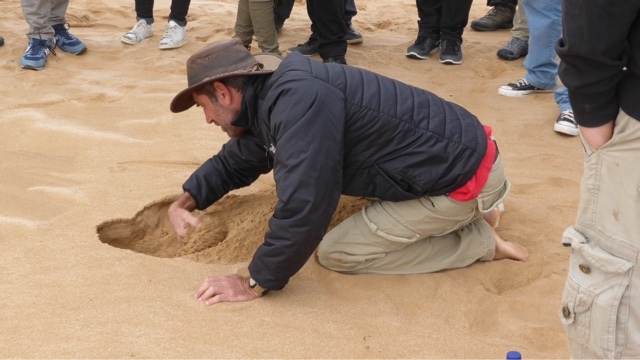 He noticed its track, like a little stepladder going up a dune and saw the faintest impression which suggested that it had come back down and buried itself in the damp sand under a succulent plant. He blew on the area where he thought the snake was and took a close up digital photo of it which he passed around. 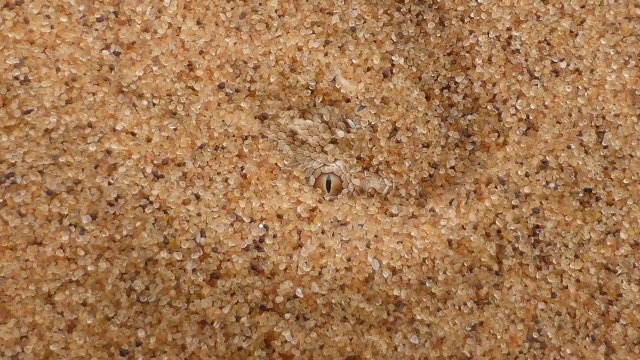 There, peering out from under the sand was a single beady snake eye watching for prey. 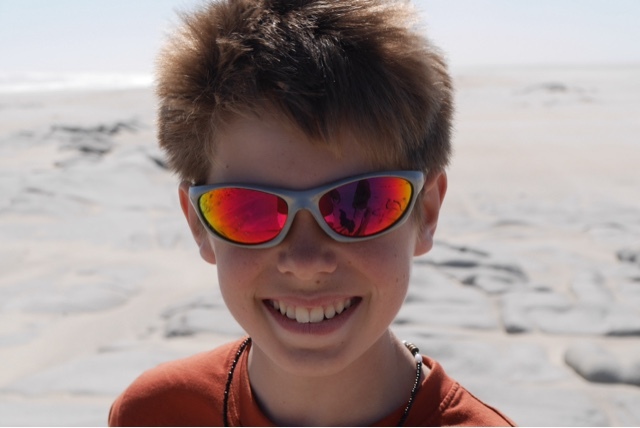 Chris blew a little more sand off and there it was, a tiny little viper rigid in the sand. 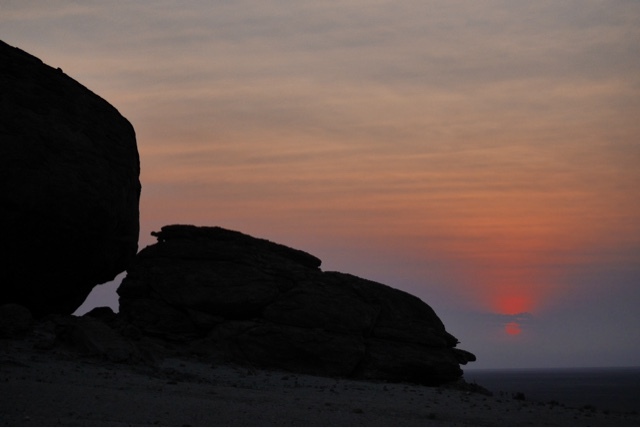 He told us a lot about the composition of the desert too, the reddish glow on some dunes comes from ruby-coloured garnet granules. 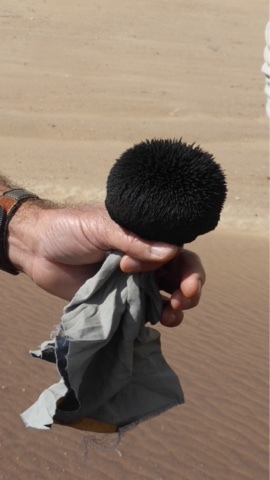 Others have black magnetite which he gathered by dragging a magnet through the sand. It stood on end like a dense, black buzz cut. 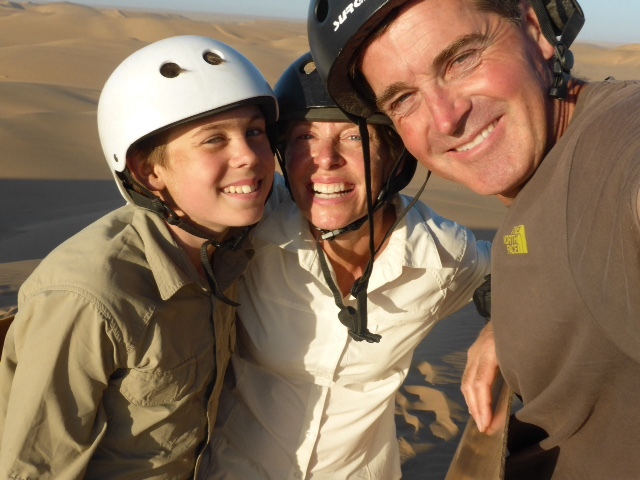 We ended the trip racing up a couple of big dunes for the view across the desert. The sun was beginning to burn off the fog by then but a keen wind kept us all in fleeces. Finally to the museum by the old lighthouse which was one of those eclectic collections which has everything from someone's model car collection to a stuffed pangolin. There was some good detail about the various Namibian tribes with lots of early photos and wooden instruments to play. I was left with a sense that we have really only scratched the surface of what Namibia's indigenous population were all about. Outside was another hyperbolic war memorial to Germany's glorious war dead, killed during their extermination of the native people... I really don't know how the black population puts up with it. To be honest though, we've been spoilt by the terrific food and service we've had everywhere else. Tomorrow we leave civilization for the Namib Naukluft desert. 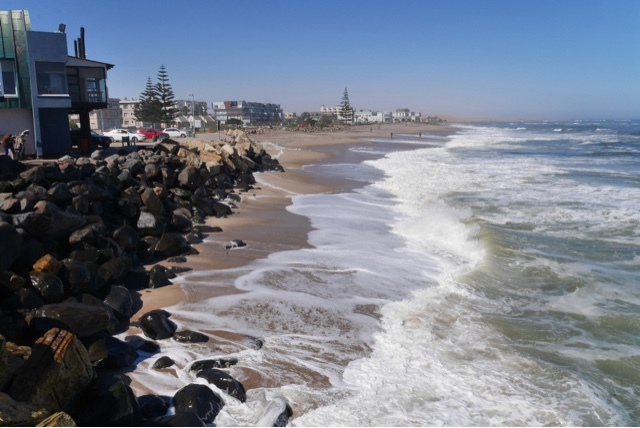 To say that downtown Swakopmund on a winter Sunday is quiet, is to suggest that the Arctic is a tad on the cool side. It is not just quiet, but post-apocalypse silent. You could have a snooze in the middle of a major intersection without interruption. It feels a bit like being on the set of The Truman Show - complete with pastel coloured Victorian doll-house architecture. It does have a West Coast USA vibe in fact with funky little cafes and art shops. Just no people or cars. At the sea front though there were one or two other survivors of whatever Extermination Event had afflicted the rest of the town. Small knots of people - some in Sunday best - were having a stroll on the pier. The mighty waves roared underneath us shaking the wooden piers of the pier. Stocky, bronzed fishermen cast off into the swell. The sun had burnt off the fog and a warm breeze was ruffling the palms. At lunchtime we made for the Tiger Beach Bar for what were reputed to be the best calamari in Namibia. Its a great spot on a gentle bit of beach. Though probably not if you are a squid. We all felt a woozy from several busy days, though the sun and the Windhoek lager probably contributed. We should insist Tom has a soft drink next time. 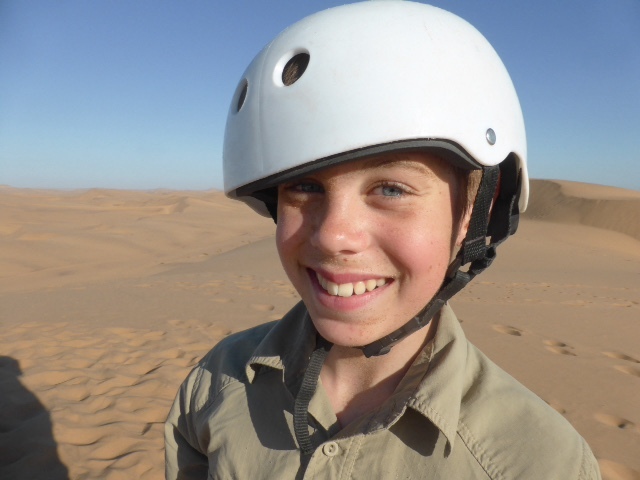 He chose the day's next activity: Sand Boarding! 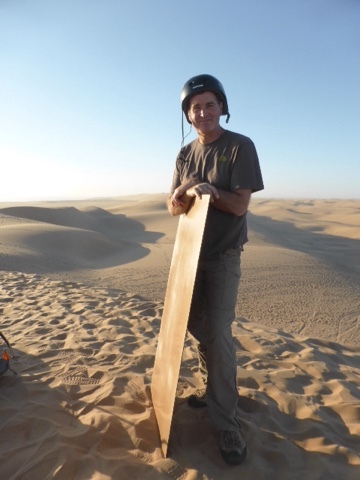 It's like Snowboarding but, erm, on sand. Actually without the snowboards too. They were available but we went for the lying down option on some high-tech, purpose-built "bits of fibreboard". We waxed them and had the instructions about lying down head first, gripping the front and bending it up, keeping our feet in the air unless we needed to steer and trying to avoid getting a mouthful of sand. Philippa was the first to go down what looked like an awfully steep bit of dune, but away she went, and almost down the next slope as well. She was a natural! Tom was more cautious; "hmmm... don't push me, I'll just eeaaase myself over - no I'm fine. Er, count me down THEN I'll go" etc etc, but soon he was flying down the slope too. I went next and found a new way of braking at the bottom; simply open your mouth and fill it up with sand, thus ensuring there is less to slide on. Our knees and elbows took a beating and walking back up was murder. Steep, deep sand that swallowed your boots. But it was brilliant and the slopes got steeper and longer. P flew down the two-stage hill and simply didn't stop at the bottom. She was a tiny spec in the dunes, zipping along as if on a tiny hovercraft. To his great credit Tom volunteered to be first over the biggest and steepest dune of the day, raising eyebrows among the too-cool-for-school boarders with us who had decided that what we were doing looked like a whole lot more fun. Off he went, speeding down the hill like a freight train and coming to a stop with a graceful starfish-chucked-into-the-sand rolling technique, which I am sure is what the professionals use. The boarding folks drove us from the big dune straight to the Jetty restaurant at the end of the pier. We had sand stuck to our faces and matted hair and arrived to find a smarter place than we had expected but we got a table overlooking the sea and the setting sun. P and I contemplated our weary limbs and skinned knees as T tried to convince us that we needed to go the next day as well. When we emerged to walk home, there was a stiff wind blowing and a sea fret blowing a fine mist in our faces. It was seriously cold and we only had the thin shirts we'd been boarding in. 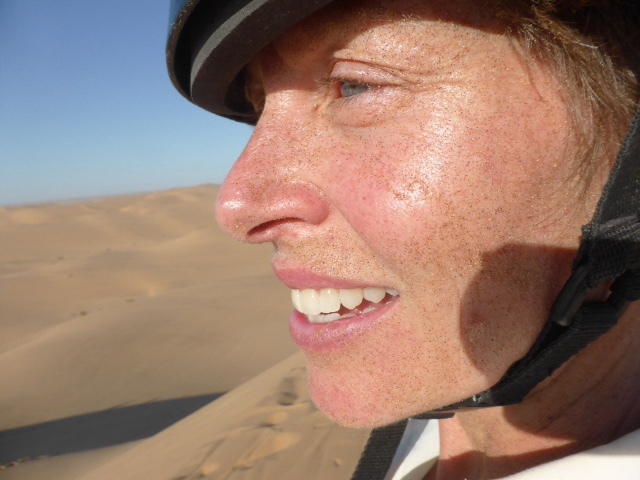 We scuttled home through the deserted, foggy streets to warm beds and dreams of giant sand hills. 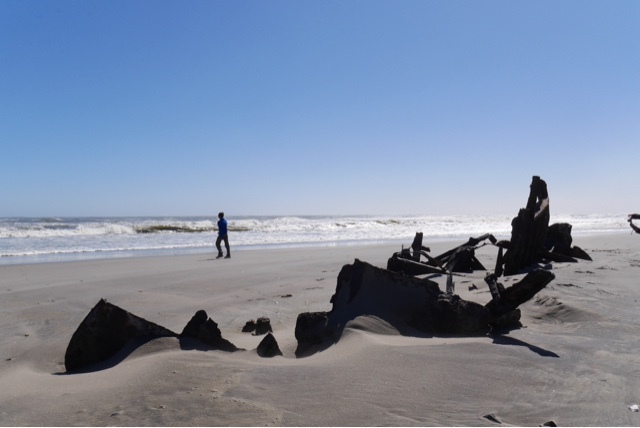 I have wanted to go the Skeleton Coast for as long as I can remember. 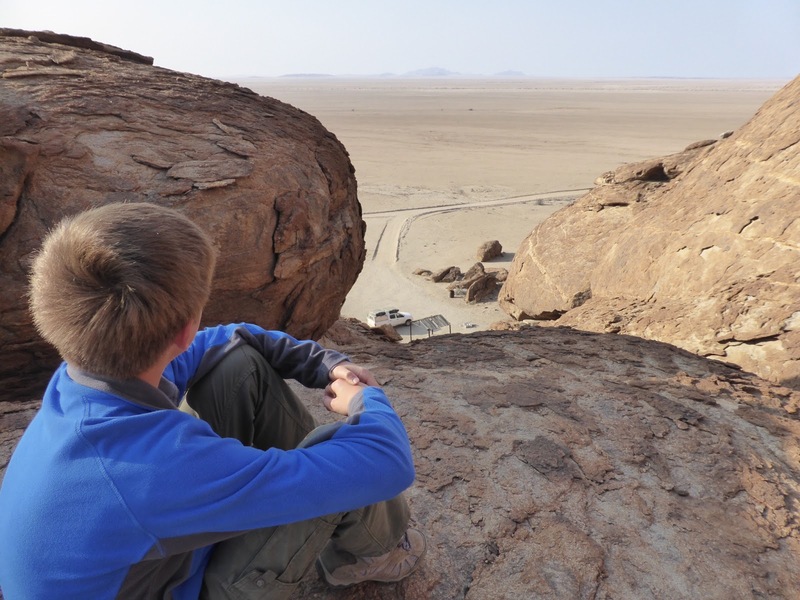 As a boy it seemed to define remote and exotic; a cruel coastline backed by an inhospitable desert for mile upon mile - almost half the length of Namibia right up to the Angolan border. It is every bit as wonderful as I imagined it to be. But first we had to get there. The Rhino Camp has an acoustic unlike anywhere else we have stayed. The rock faces all around us bounced every little sound off them. There were only a few birds but their song echoed all through the gorges. Today we DID get showers thanks to a fire lit under an oil drum full of water. We have got quite used to showering in the open air and the sunshine, surrounded by a little grass or brush enclosure, watched by the birds and the geckos. We've also got used to cooking over an open fire. Its quicker than the gas burner and more satisfying, and the dense mopane wood catches quickly and stays hot. We started the day with porridge and coffee and let the sunshine warm us up. I set up the solar panels to charge our devices battery and within an hour is was almost a third of the way to being fully charged. We called in at the main gate to see the rhino displays and also reflect that they really won't be around for all that much longer because some ignorant, arrogant, senseless idiots are under the ridiculous delusion that their horns will have an impact on their libido. Someone needs to tell these morons that they could just bite their nails. They are made of the same stuff and it would have exactly the same effect - ie none. Can you imagine a more sad and pointless way to eradicate an entire species from the planet. We left the Rhino Camp along another rutted track which soon became a rutted gravel road, heading southwest towards the coast. There was a Land Rover approaching in the distance. We stopped and they stopped and we compared notes. They were a cheery young German couple who'd been climbing in Spitzkoppe and were thinking about doing our route in reverse. I told them if they could get past the steep, wet bit of track beyond the Rhino Camp they would be OK for the rest of the route, but going uphill there would be a lot harder than coming down it like we did. We compared maps and they told us that the road ahead was very badly corrugated. It was nice chatting to kindred spirits in this empty landscape but eventually we bid our farewells, started the engines and went our separate ways. The road was very badly corrugated and the gravel so deep that it was hard to get enough speed to glide over the ruts. At every crest we squinted to see the sea but the haze made it impossible to make out where the land ended and the water began. But then, just a few kilometers from the coast we could see blue water and big frothing surf. It was thrilling to drive out of the flat desert to such a dramatic bit of coast stretching away in both directions until it was lost in a milky haze at the horizon. We needed to go south but wanted to see a shipwreck marked on the map and drove north for half an hour on an eerily smooth salt road that bobbed over the dunes. 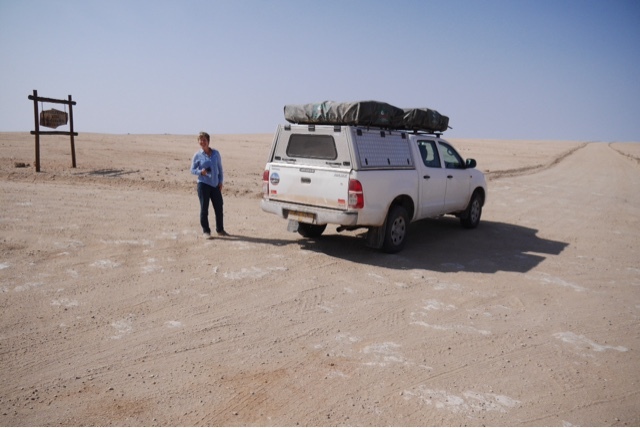 We turned left at the point marked on the satnav, but the sand had obscured any trace of a track so we made our own - the four wheel drive struggling to pull us through the deep sand. After a couple of K we stopped on a hard bit of beach (so I could turn around) and got out. 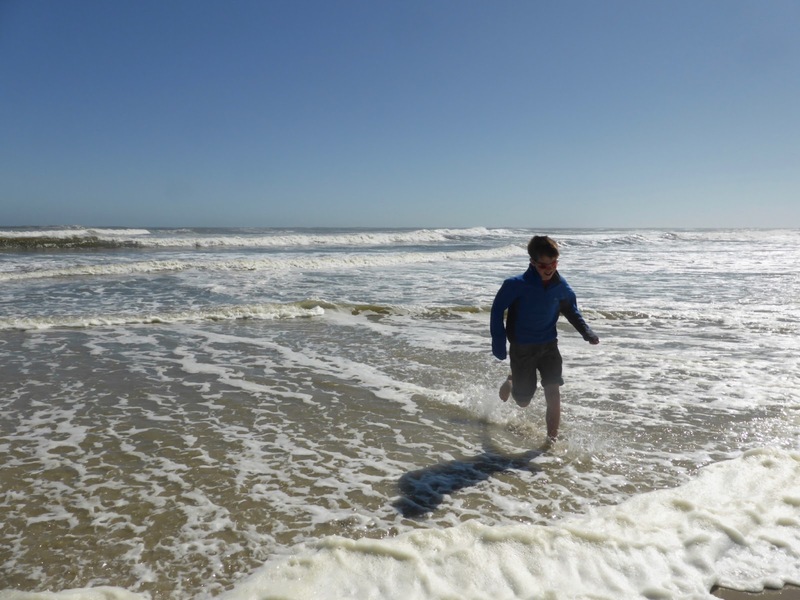 The wind was blowing, the sea was pounding, the sand was almost too bright to look at in the brilliant sunshine. This was a no-nonsense bit of African beach; no buckets and spades, no donkeys or ice-cream - no people, but the constant threat of being swallowed up by the sea or starved on the beach. It was littered with the bones of seals and birds, and near the waters edge, the rusting ironwork of the Winston, a fishing boat that ran aground in 1970. 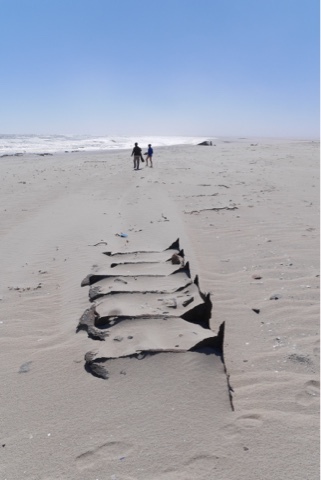 A little further up was the skeleton of another - unknown - vessel, being slowly eaten by the waves. We felt tiny in this great big coastline and didn't want to leave. We had a makeshift lunch sitting in the lee of the truck: lumps of cheese, slices of apple, a few dill pickles, a bag of crisps and some trail mix hit the spot. Feeling somewhat crispy from the sunshine we got back into the truck and onto the road - south this time, towards Swakopmund. 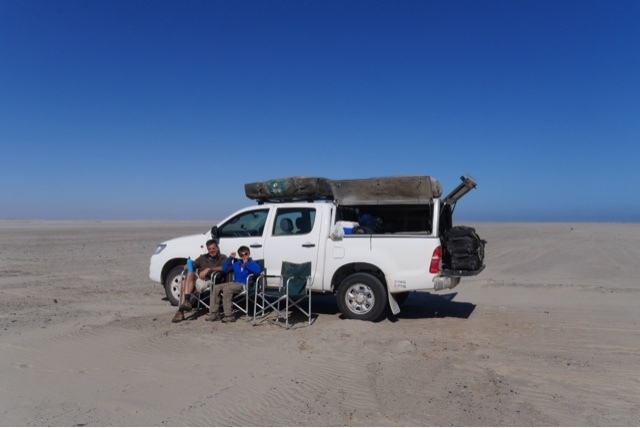 There are odd little fishing camps along the road and a small community at Cape Cross where the Portuguese navigator Diego Cao landed in 1485 - the first European to reach south west Africa. He built a stone cross which remained there until 1890 when it was nicked by a museum in Berlin. There is a replica there today but what really grabs the eye (and the nose) is the enormous seal colony along the shore. 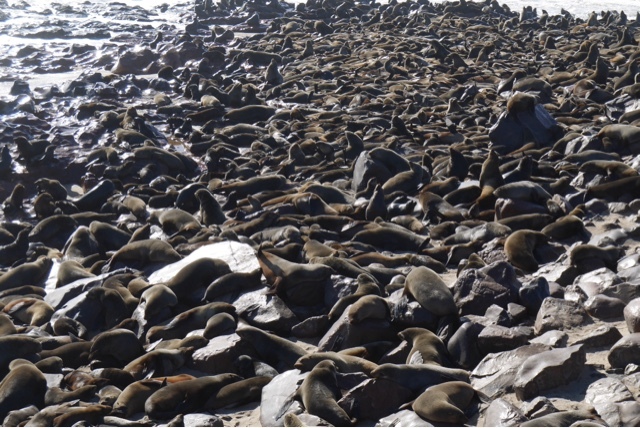 Eighty to a hunded thousand of them, barking and grunting and shuffling about and riding the surf. Climbing out of the truck was like getting a faceful of ammonia. "Why are we doing this?" asked Tom, who has never been good with olfactory overload. But as soon as he saw the first seal, lolling by the boardwalk he whipped out his camera. And then of course the beach was so full of them it looked like one brown, blobby mass. 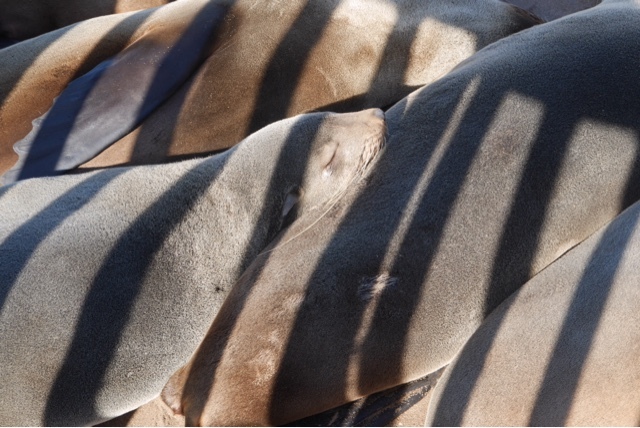 Youngsters were suckling, older ones were baring their teeth at each other and barking, but most were lazing in the sunshine. 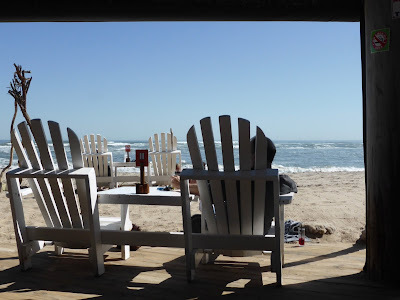 A little further down the road is Henties Bay, a pastel coloured village by the sea with a hole-in-the-wall restaurant called "Fishy Corner" which promised great things... And it delivered! 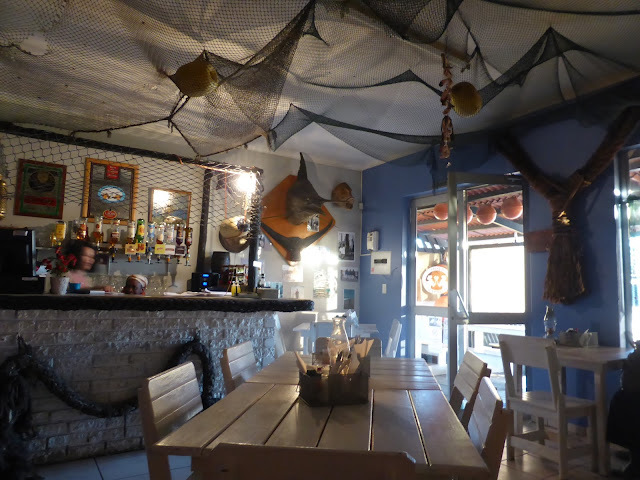 Inside, it was all fishing nets and white-plank tables with a mounted marlin head on the wall. The fish was fresh and huge, the beer cold, the waitress jolly. We couldn't linger though, it was now five and we had an hour left to drive on unlit salt-pan roads in the last of the daylight. Just a few K down the road though we saw a large ship rolling in the surf and pulled off again for a look. 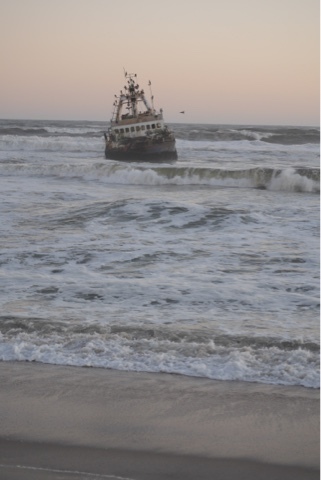 It was another fishing boat that ran aground in 2008. We watched it tossed around by the surf as the sun went down. Back on the road a thin mist was blowing in from the sea and it turned a lot colder. Eventually we could see an orange glow ahead - the lights of Swakopmund which seemed like a huge metropolis in comparison to all the tiny places we've driven through. The streets were almost completely deserted - no people, no cars. The fog created a misty glow around the orange streetlights and the wind whipped up the leaves of the palm trees. The Cornerstone Guest House is a sleek little development in the middle of a walled garden. Six immaculate suites, and ours is like a small apartment. Our faces were toasty from the wind and sun and we went to bed with the sound of the wind blowing outside.